Our Gift Vouchers are the Ideal Gift! A memorable holiday is just a click away! 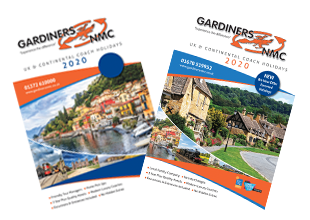 If you’re looking for ideas and inspiration for a short break, holiday or day excursion, Gardiners NMC can help. We’re an award nominated, family-run coach company based in Northumberland. We offer local pick-ups and optional door-to-door collection across north-east England and now, through our new office in Epsom, in Surrey and south London. We’re proud of the service we offer, together with our modern air-conditioned luxury coaches, and our professional and friendly drivers. Give our knowledgeable team a call and let us help you plan your next short break, day trip or holiday experience.